Jessica Camp (15) passes the ball up for Miami Trace during an SCOL match against Chillicothe Thursday, Sept. 15, 2016. 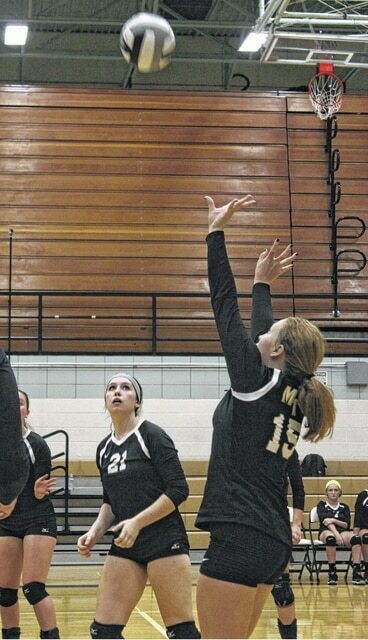 Also pictured for Miami Trace is Kylie Reisinger (21). The Miami Trace Lady Panthers volleyball team had just withstood a fierce comeback by their rivals, Washington, on Tuesday evening. In that match, Miami Trace took a two sets to none lead, only to see Washington win the next two sets, forcing a deciding fifth set. Miami Trace won that tie-breaking set, 17-15. On Thursday, the league-leading Chillicothe Cavaliers came to Miami Trace High School and Miami Trace, with just one league loss on the season, was looking to pull into a tie for first place in the SCOL. Chillicothe was up to the challenge, winning in straight sets, 25-22, 25-23 and 25-18. “We’re there,” Miami Trace head coach Doug Mace said. “We’re able to compete with them. With that big game Tuesday night, fatigue might have set in just a little bit tonight. “There’s a reason why Chillicothe is undefeated in the league,” Mace said. “They are probably the most consistent team in the league. They do a lot of good things. They take care of the ball well and they have some good hitters. All-around, that’s a really nice team. For Miami Trace, Samantha Ritenour had six kills. Clare Sollars and Jessica Camp each had two ace serves for the Lady Panthers. Miami Trace held a 22-18 lead in the second set, only to see Chillicothe come back and win, 25-23. “We let that slip away,” Mace said. “In the first set, the play was going back-and-forth, point-for-point right to the end. In the third set, we became mentally fatigued. Chillicothe improves to 8-0 in the SCOL, 9-3 overall. Chillicothe has lost twice to Unioto and once to Logan Elm this season. “Miami Trace has definitely improved since we first played them,” Chillicothe head coach Greg Tracey said. “They made some changes to their lineup. I thought Sam played a very good game for them. (Erica Marshall) is really solid. Those two are very good players. They played very good, scrappy defense tonight. We were frustrated trying to get the ball on the (floor). “For our girls, Olivia Eblin, she hit outside for us tonight,” Tracey said. “Every time we got her the ball, she did a great job of putting it on the floor. Rylee Putnam did a good job in the middle. “As a team, every time we needed a pass, or we needed to put the ball on the floor, or we needed something to happen for us, it happened, because our girls believed they could do it,” Tracey said. Miami Trace is now 6-2 in the SCOL, 6-5 overall. The Lady Panthers are taking part in a tournament at Circleville Saturday. The action begins at 10 a.m. Miami Trace’s first match Saturday will be against these same Chillicothe Cavaliers.